But let's get serious. Nobody cares about how pretty or pleasant smelling anything is, because they're too busy spending all of Fall thinking about how crazy fat they're going to get on Thanksgiving. Will it be turkey or turducken? Mashed or scalloped potatoes? Apple or pumpkin pie? Since the priority is food on Thanksgiving Day (aka National Eat 'Til You Puke Day), most gluttonous celebrators could care less whether or not anything looks pretty. That means any kind of decorations are out—especially on the dinner table. That's just less room for food. But you over-zealous gobblers can have the best of both worlds with these ten DIY centerpieces and table decorations for Thanksgiving that you can actually eat—or at least re-purpose later. They pretty much all have the added bonus of being particularly healthy, so you can at least feel better about stuffing your face even more than you normally would. 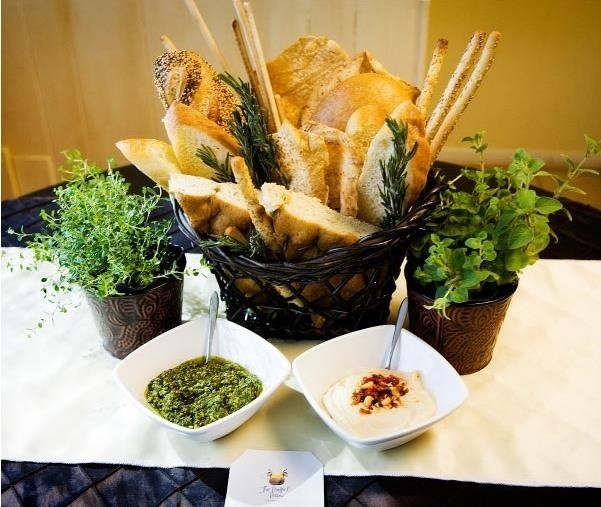 Grab a few different kinds of bread, slice it up, and throw it on the table in a basket with some dips and fresh herbs on the side. 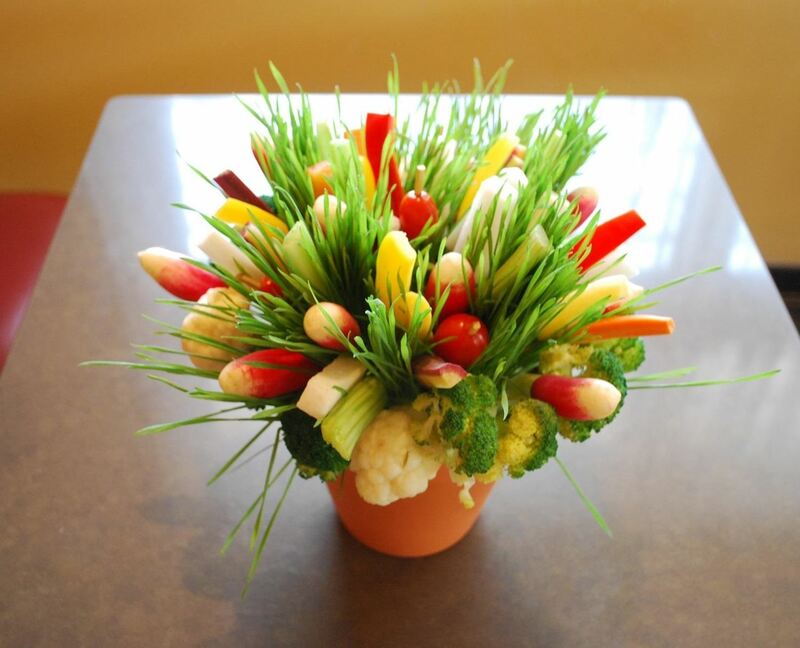 It's way more interesting than flowers, and at least you won't have to keep hearing "When do we eat?" All it takes is a paring knife to turn a butternut squash into a blossoming flower. Once your guests leave, you can cut off the petals and serve 'em up as a side dish the next day. Head over to Paper, Plate, and Plane for carving instructions. For something cheap and simple, make an apple swan for each place setting. 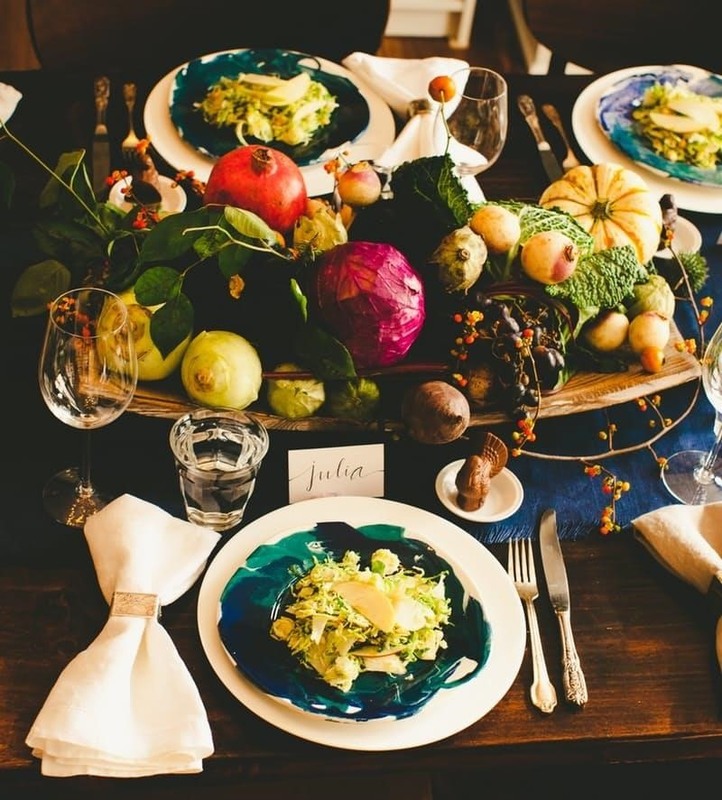 All you need is a knife, and you can easily turn them into place cards with each guest's name. Check out The King of Random's tutorial to find out how to make them. 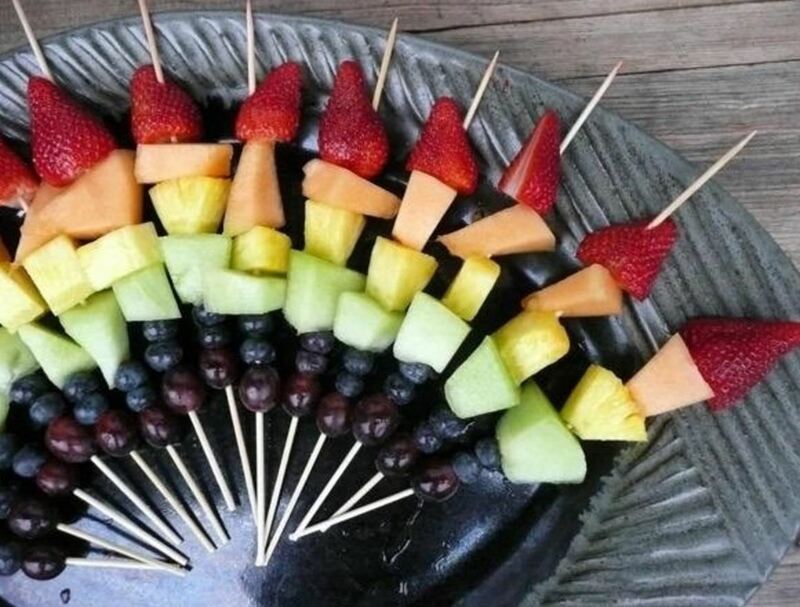 A few different kinds of fruit and some skewers make a nice-looking centerpiece that guests can snack on while they wait for dinner. 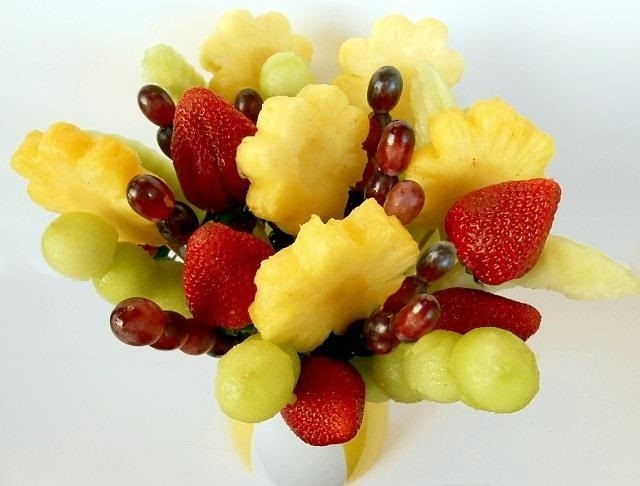 If you've got the time and patience, you can get fancy by cutting the fruit into different shapes. Or, if you just want to make it plain and simple, go with basic wedges or use a melon baller. It also cuts down on time if you buy some fruit that's small and doesn't need to be cut, like berries and grapes. You don't need to cut up fruits and vegetables to make them look good. The Kitchn's Faith Durand made this gorgeous centerpiece by arranging whole produce and holding it in place with skewers. Check out the tutorial along with a bunch of recipes to help you use it all up here. 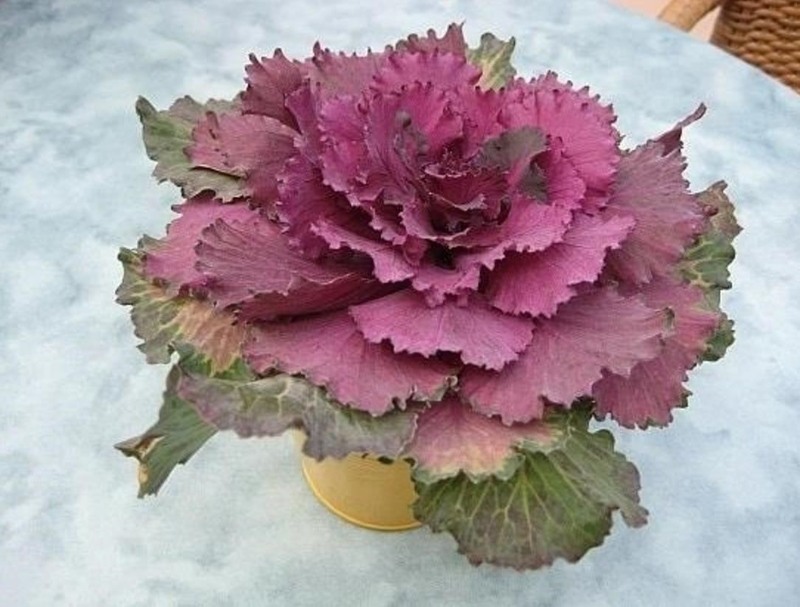 If you want to go as simple as possible, a brightly colored brassica (aka cabbage) makes a pretty centerpiece all on its own. Just find a container to put it in and spread out the leaves in a circular pattern. For best results, be sure to choose something you wouldn't mind eating in a salad. 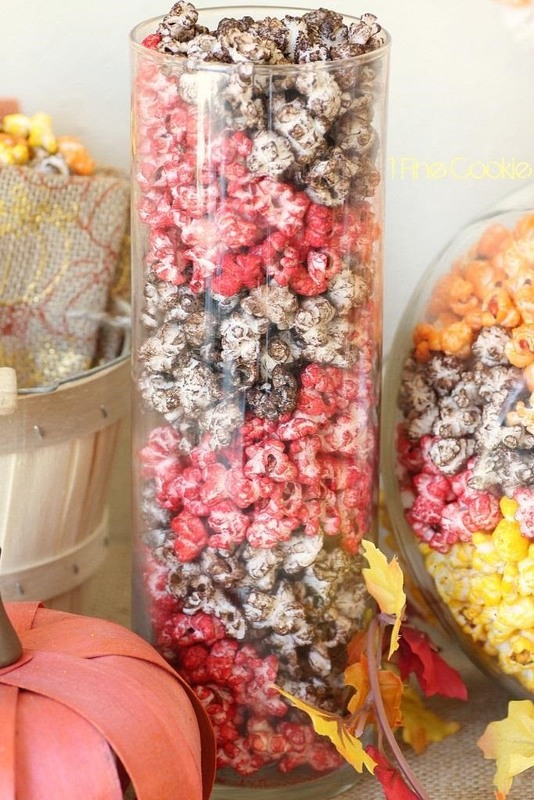 Sprinkle some powdered food coloring on popcorn and pour it in a clear container for an easy edible centerpiece. It works best with homemade popcorn, but you could probably pull it off with the microwavable kind in a pinch. Get the full recipe over on 1 Fine Cookie. Got a sweet tooth? You can make a cute cabochon candy container out of a disposable bowl and some spray paint. All you have to do is cut the sides of the bowl into strips to make the design. This one has the candy glued to a Styrofoam ball to keep it in place, but if you want to actually be able to eat it, you could line it with an uncut bowl and just pour the candy in. Head over to Camille Styles for instructions. 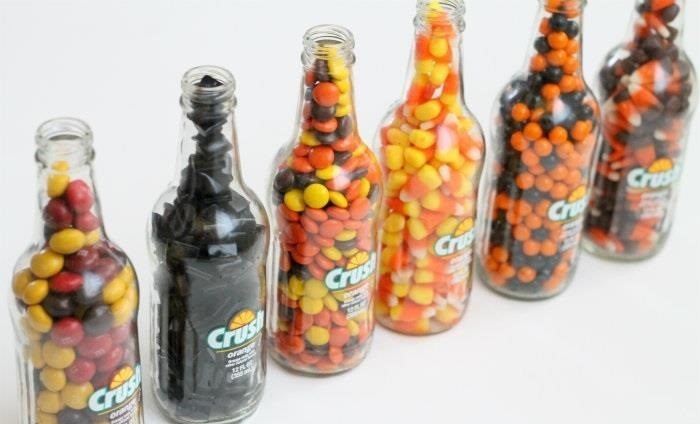 To make it even easier, pour the candy into clear glass bottles or jars and set it on the table. 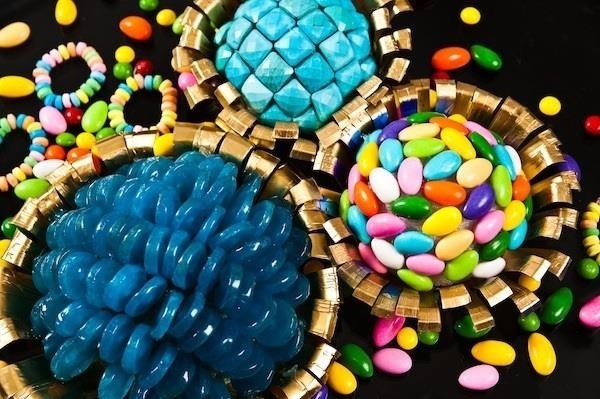 It's better if you can find candies that match the colors of the season, but you can go with whatever mix you like best. 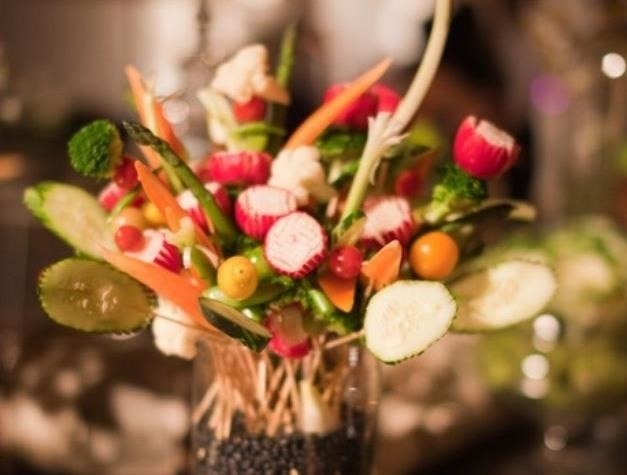 Much like the fruit kebabs, a bouquet of skewered veggies makes a great healthy snack guests can munch on while you're cooking. You can be as simple or fancy as you want—go with basic slices or make flowers or other shapes if you're feeling ambitious. 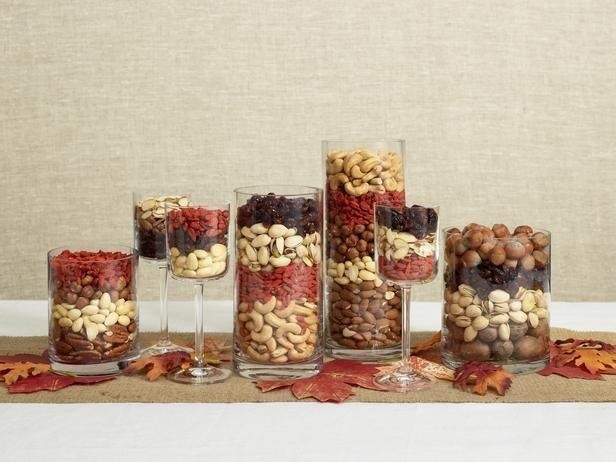 Layer nuts and dried fruits in clear glass containers like a trifle dessert for guests to snack on before dinner. Even better, most dried fruits are colors that are considered "fall" or "Thanksgiving" colors, so you can use any mix you want and it'll look festive. 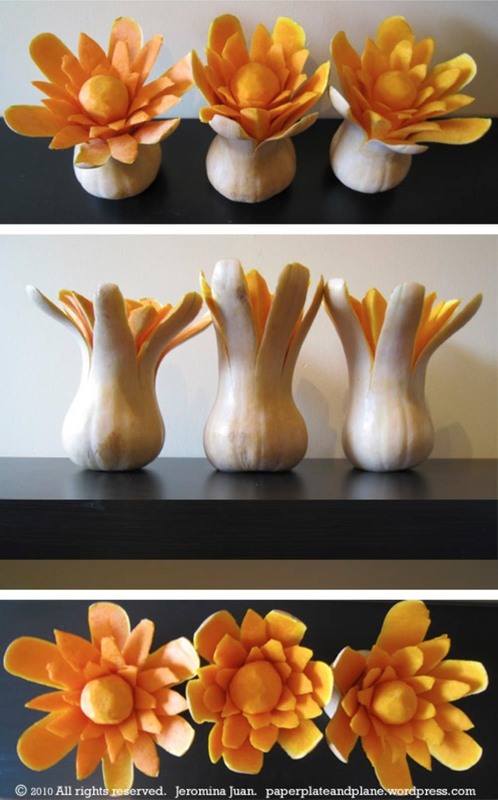 This is a perfect way to use those adorable little gourds they sell at all the supermarkets this time of year. Just hollow out a spot and drop a candle into it. As long as you make a barrier so the wax doesn't drip onto the pumpkin, you can still cut up the remainder to use in tomorrow's dinner. 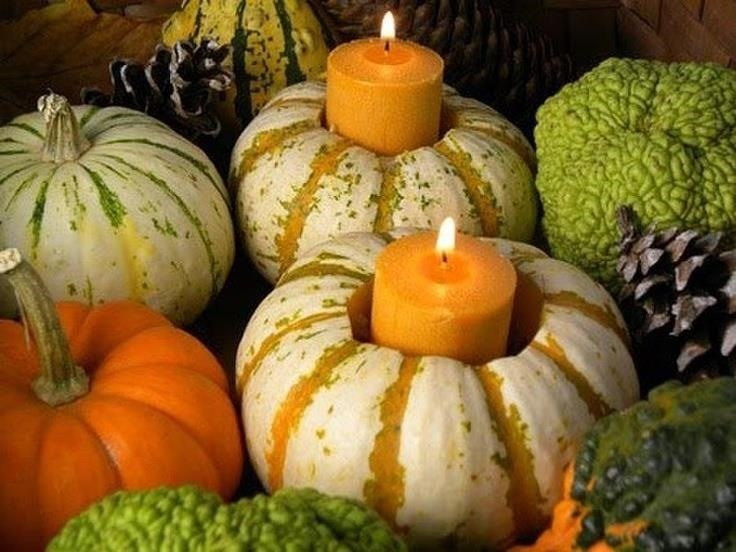 If you're not worried about them still being edible, you can actually turn your pumpkins into candles. All you have to do is cut them open, remove all the seeds and attach a wick to the bottom. Then, fill with wax and add your favorite scent. Simple and cute. Check out the post over on Henry Happened for more details. 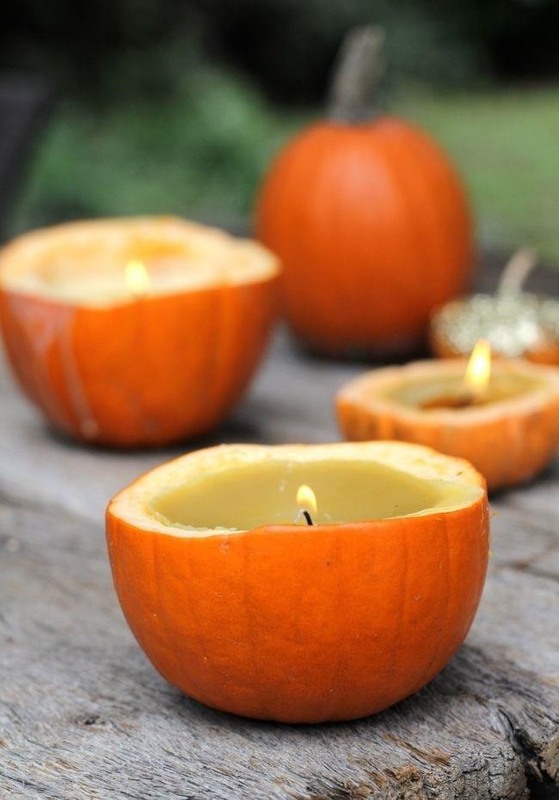 You can also use foods like butter and orange peels to make decorate candles if you want.